To help you find the Best Dog DNA Testing, TopConsumerReviews.com provides you with an in-depth Live Well Testing Review. What is the best Dog DNA test? The answer to that question depends on what you're looking for. Some dog owners are curious about their dog's breed, especially if he or she was adopted from a shelter or is obviously a mix. Similar to DNA tests for humans, Dog DNA testing can give you a very good report on the percentage of your pet's ancestry. Many pet lovers use Dog DNA tests to gain insights into any inherited conditions or breed-specific diseases and ailments their beloved companion may be at risk of developing. With this information they can put into place the right diet, exercise, and supplements to reduce or prevent genetic ailments from developing in the future. Live Well very clearly states that this is not a breed identification test, so be aware that if you're trying to find out if your mutt is a Beagle or a Boxer, you won't get that information with the Canine HealthCheck. The test costs $129.99, and ground shipping is free; USPS Priority Mail or UPS options are available for an extra fee. Also, if you sign up for the Live Well newsletter, you'll get a 5% off coupon to use on any product or service in their online store. We got this offer as a pop-up as we browsed the site. In general, customers are very happy with their shopping experience when using Live Well Testing. While we didn't find many reviews that specifically talked about the Dog DNA Testing, most people say that they got exactly what they paid for, and that their tests were processed accurately and quickly. While Live Well's Canine HealthCheck isn't the most robust on the market for what you pay, it does provide a good amount of information about health conditions your pet could develop, and the company itself has a solid reputation. For some dog owners, getting a Dog DNA report could mean the difference between being able to rent a property or getting turned down for homeowner's insurance. Many communities have restrictions on dog breeds, or require their homeowners to have extra liability coverage. And, of course, for those who work with show dogs or who need absolute proof of pedigree, a Dog DNA test can confirm the bloodline. Results. Will you be able to find out the information you're looking for, from your dog's breed to inherited traits and possible health conditions? How many breeds and/or conditions does the test screen for? Cost. How much will you spend to get the test kit delivered and processed? Are there any discounts for ordering more than one kit at a time? Reputation. What do other customers have to say about their experience with the business, from ordering to getting results? Is it a reputable company? 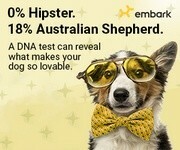 TopConsumerReviews.com has reviewed and ranked the best Dog DNA Testing services available today. We hope this information helps you choose the right dog DNA test that will give you the details and guidance you're looking for, to keep your faithful four-legged companion healthy and happy for many years to come! Finding out your dog's genetic background is relatively simple: a DNA blood test can be ordered by your veterinarian, or cheek swab test kits can be purchased online or at pet supply stores.